This article is part of a five-article series, inspired by my trip to the Mt. Everest Base Camp. This episode, the last in the series, is a blog on how this trip changed me as a hiker and, more importantly, as a person. While I have been hiking for a while, the trips are mostly through hot and humid jungles or trails relatively near sea level. There are loads of mountain hikes in the Philippines, but nothing breaches the ten-thousand foot mark, altitude-wise. So preparing for this trip was a bit more serious for me. It would be the first time for me to go past 5000 meters above sea level, and the first time to go on a hike longer than six days. It would be the first time for me to encounter snow. I am susceptible to altitude sickness too, so there was an added element of danger. Just from getting my body, my gear, and my state of mind ready, I changed. For the first time, I took the physical training for hikes very seriously. I did a ton of cardio, and traveled out of the country twice to hike up a couple of ten-thousand footers. I skipped football, my beloved sport, for months to take care of my knees and ankles. I trained for three weeks while wearing a 20 lbs. weight vest. It might sound excessive but I had a very specific goal: I would make it to Base Camp, and I would not be going down that mountain in a helicopter. It goes without saying that the focused and deliberate training for the hike helped. I have never been this light on my feet (I ended the hike at 143 lbs. – 6 lbs. lighter than when I left for Nepal) and strong. I also had no problems with the altitude, the first time in five high-altitude hikes that I barely had a single symptom. This focused and deliberate effort, since I started training, has carried over to my daily life even after the hike is done. I feel like whenever I would start to do something, my mind automatically goes on radar-lock mode, and it starts creating a specific plan to how I would achieve or accomplish that goal. I feel like I’m even more disciplined than before, and that I am far less affected by distractions. Just a week after the trip, I feel that I am simply so much more efficient with my time (especially at work) and you can just imagine the positives this means for my personal life. On a different note, I also find that I am even more patient and understanding than before. After learning hard lessons on prioritising and deprivation (see previous post, Ep. 4), I no longer sweat the small stuff. The locals carry huge loads on their backs. Anything from Coke to cooking pots, everything gets to the villages on the backs of people (or yaks or mules, if they can afford one). For some villages, the nearest hospital is a week away. Job opportunities are greatly limited to being porters or guides. They live tough lives in some of the toughest environments I’ve seen, and always at the mercy of the weather and the cold. Yet, they were some of the most selfless and caring people you will ever meet. How can we complain about the weight of an extra water bottle, when a porter in his teens is making money for school with 60 lbs. on his back? How can we not appreciate a miserably cold plywood room, when our guides elected to sleep outside so we could have some privacy? This experience forced me to see the big picture, always. To see situations from a different – and bigger/wider – perspective. To see things from a different set of eyes. To see that when things are not under my control, it’s alright to let go and make the best out of the situation. I will always be grateful for this trip, because it served as a reminder of the immense value of personal discipline, and the importance of always seeing the bigger picture. Thank you, Sagarmatha. You were quite the teacher. 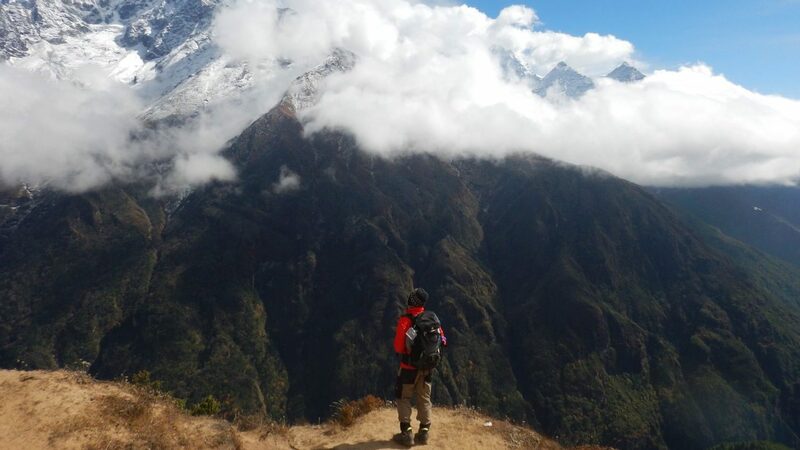 Featured image: Me, somewhere along the way to Dingboche, at about 4300 MASL. You and Sagarmatha are quite a teacher. Am someone yawning to learn more each passing day and the virtues pass along the way.